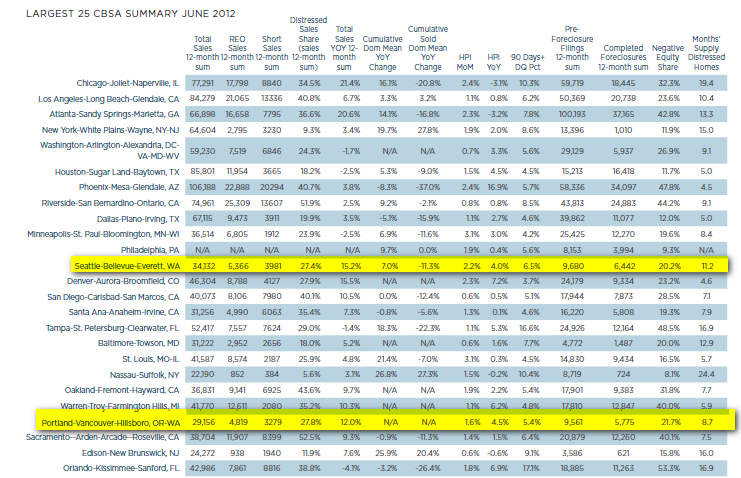 and demand, declining REO sale shares and a slowly declining foreclosure inventory. to lower their interest rates further can help decrease the flow of future delinquencies. positively impacting home prices, and is a sign of real improvement in the housing market. Home price purchases were mixed month-over-month in May, with non-distressed prices up and short sales down, according to the Campbell/Inside Mortgage Finance HousingPulse tracking survey. From April to May, transactions reported by HousingPulse survey respondents revealed the average price for non-distressed properties rose 1.7 percent, while the average price for short sales fell 0.7 percent. For damaged REOs, the average price went up 1.8 percent and for move-in ready REOs, the average price dropped 1.5 percent. The stabilization of home prices seen in some instances is due to a shortage of inventory, HousingPulse reported. These shortages are led by underwater homeowners who are holding onto their homes until home prices move up. Also, for distressed properties, there’s a shortage of inventory due to slower processing of foreclosures by mortgage servicers, according to HousingPulse. properties are in demand and sat on the market for an average of 10.6 weeks in May, the lowest of any property category.
) revealed that the share of distressed properties in the housing market in May was 46.1 percent. This marks the 27th consecutive month in which theDPI hovered above 40 percent. Anecdotal evidence also suggests that the shortage is especially prevalent in California. One realtor in the state said that inventory in Orange County was “super low” and the months’ supply of unsold homes is down to just 45 days. Another California agent said that inventory in the Santa Clarita Valley, which is 35 miles north of Los Angeles, is very low, and reported less than 500 listings, which is well below the 1,500-1,800 properties the agent stated is the average. The Campbell/Inside Mortgage Finance HousingPulse Tracking Survey includes approximately 2,500 real estate agents nationwide each month. April 5, 2012 – The list of housing markets showing measurable improvement expanded slightly to include 101 metropolitan areas in April, according to the National Association of Home Builders/First American Improving Markets Index (IMI), released today. Thirty-five states (including the District of Columbia) are now represented by at least one market on the list. The index identifies metropolitan areas that have shown improvement from their respective troughs in housing permits, employment and house prices for at least six consecutive months. The 101 markets on the April IMI represent a net gain of two from March, with 13 metros being added and 11 markets slipping from the list while 88 markets retained their places on it. Among the new entrants, areas as diverse as Rome, Ga.; Coeur d’Alene, Idaho; Greenville, N.C.; Brownsville, Texas; St. George, Utah; and Huntington, W.Va., are now represented on the IMI. A complete list of all 101 metropolitan areas currently on the IMI, and separate breakouts of metros newly added to or dropped from the list in April, is available at: www.nahb.org/imi. Editor’s Note: The NAHB/First American Improving Markets Index (IMI) is usually released on the fourth business day of each month at 10:00 a.m., ET, unless that day falls on a Friday – in which case, the index will be released on the following Monday. A full calendar of future release dates can be found at www.nahb.org/imi. Optimism is building that the housing industry is nearing a bottom — finally. A home in Brookline, Mass. Home sales and home building are forecast to rise this year after sliding steeply the past five years in housing's worst downturn since the Great Depression. Chief executives are more positive. JPMorgan Chase's Jamie Dimon said last week that housing is near its bottom but could stay there a year. Stuart Miller, CEO of home builder Lennar, said the market has started to stabilize because of low prices and record-low interest rates. Market researcher RBC Capital Markets has also turned from a "bearish" view on housing to saying that 2012 "will mark a step in the right direction." As foreclosures pick up this year, "prices will drop," saysStan Humphries, Zillow chief economist. He says home prices won't bottom until later in 2012 or next year. "This year will feel a lot better to builders, investors and real estate agents than to consumers," says Jed Kolko, economist for real estate website Trulia. Housing's outlook is brightening with signs of a better economy. Last month, U.S. employers added 200,000 jobs, and the unemployment rate fell to 8.5%, lowest in nearly three years. •Sales. 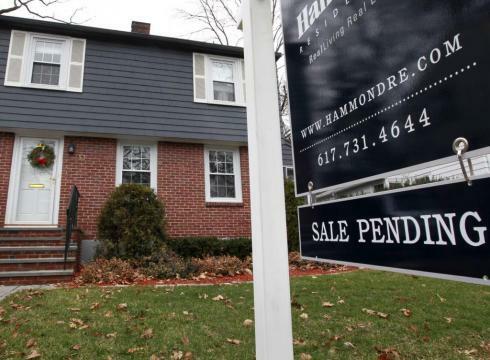 Existing home sales will rise 12% this year after a 2% increase last year, and new home sales, coming off a horrid year, will jump 74% this year, Moody's Analytics predicts. November's existing home sales hit their highest mark in 10 months, and new home sales were the year's second best, IHS Global Insight says. •Construction. Single-family housing starts will rise 37% this year, Moody's predicts, after falling 9% last year. Home builder stocks are on a run. The S&P 1500 homebuilding index is up 38% since mid-October, vs. 7% for the S&P 500. Ultra-low interest rates mixed with stabilizing home prices continued to push housing affordability in the third quarter near its highest levels in more than two decades, according to the latest National Association of Home Builders/Wells Fargo Housing Opportunity Index. For the third quarter, 72.9 percent of all homes sold were affordable to families earning the national median income of $64,200, according to the index. This marks the 11th consecutive quarter that the affordability measure was above 70 percent; prior to this it rarely was above 60 percent. "With interest rates at historically low levels and markets across the country beginning to improve, home ownership is within reach of more households than it has been for nearly two decades," Bob Nielsen, chairman of the National Association of Home Builders, said in a statement. "However, tough economic conditions – particularly in markets that experienced major changes in house prices and production – as well as extremely tight credit conditions confronting home buyers and builders continue to remain significant obstacles to many potential home sales." The most affordable major housing market nationwide? Lakeland-Winter Haven, Fla., in which 92.5 percent of all homes sold were found to be affordable to households earning the median family income of $53,800 for the area. Other affordable major markets included Toledo, Ohio; Youngstown-Warren-Boardman, Ohio-Pa.; Indianapolis-Carmel, Ind. ; and Ogden-Clearfield, Utah. For smaller housing markets, Fairbanks, Alaska, ranked the highest, in which 97.8 percent of homes sold during the third quarter were found to be affordable to families earning the median income of $91,700. Meanwhile, the least affordable major housing market continues to be New York-White Plains-Wayne, N.Y.-N.J., in which 23.3 percent of all homes sold were affordable to those earning the area's median income of $67,400. Better times are ahead for the real estate market in the new year, according to several forecasts and recent surveys. Fiserv, a financial information services firm, predicts that 95 percent of the 384 metro areas it tracks will see prices rise in 2012. Many surveys and economists are forecasting a very modest increase for the housing market in the new year, but after several years of dropping prices and rising foreclosures, even the slightest increase would signal a glimmer of hope for the market. In a survey by MacroMarkets of 100 economists and real estate professionals, respondents reported home values will likely rise slightly at 0.25 percent in the new year. The real estate market still faces a large backlog of foreclosures that it must work through in many markets. As such, price gains through 2015 will likely just be around 1.1 percent, according to the survey. However, this is a reversal after a forecast of 2.8 percent decline in median home values for this year. Foreclosures continue to weigh on many markets and are preventing home values from stabilizing, economists say. "The water is very deep in the living room, but it's no longer getting deeper and is starting to recede,” says Mark Fleming, CoreLogic's chief economist. 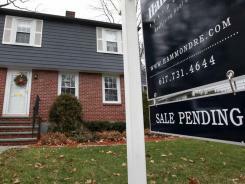 Low interest rates on mortgages mixed with more affordable housing for families in the median income range are expected help the market in its rebound in 2012, economists say. inventory of all the leaf removal tools cluttering your garage. 5 Credit Myths – BUSTED! When it comes to credit, sometimes the largest challenge is the most difficult to surmount: we simply don’t know what we don’t know, so our assumptions and inaccurate beliefs run wild and free through our mental real estate. Most of the time, there’s no harm; following finance fundamentals like paying every bill on time, every time, keep us out of credit danger zones. But when it’s approaching the time to buy, refi or even rent a home, relatively small credit score differences can stop you from getting your dream home, and can cost (or save) you thousands of dollars in interest over the life of your loan. Fact: No matter how much cash you have, if you want a mortgage, you must meet the lender’s FICO score guidelines. Of course, if you’re flush with cash, it should be relatively easy to make your monthly payments on time. But if you have come into cash relatively recently or you’re coming off a rough financial patch, lenders don’t not look at your credit score on the theory that your other assets diminish your credit riskiness. Most lenders want nothing more than to avoid having to foreclose on a home, even if the homeowner has other assets. And the best predictor of whether you’ll default on a loan in the future is how you’ve handled your credit in the past, so your credit score will drive whether you qualify for a home loan and what interest rate you’re charged, no matter how much you make. Two exceptions: if you buy a home with all cash, or take a hard money loan, which usually requires a much larger-than-average down payment and interest rate, you might be able to bypass credit score scrutiny, but you’ll pay for it. Fact: Financial responsibility and good credit are two different things. Your FICO score is meant to be a measure of your responsibility when it comes to managing debt, as proven by the fact that you have credit accounts, use them regularly and don’t abuse them. Having no credit accounts or debts doesn’t give you good credit – it gives you no credit. And on the other end of the credit usage spectrum, being maxed out on various credit accounts all the time, submitting lots of credit applications and other credit moves that indicate you may abuse your credit can actually depress your score. Best practice is to have several credit accounts (student and car loans count!) that you actively and responsibly use on a monthly basis. Fact: Your mortgage originator (broker or banker) must pull their own version of your report from their own provider, and it might have a very different score, rating scale or even different line items than the free or paid report you pulled online. This is why it’s imperative to start working with a mortgage professional as early as possible – a year in advance is not overkill – so you can detect any errors or issues and get their recommended fix in the works with plenty of lead time. Myth #4: If you’ve had a foreclosure or short sale, your credit report will be damaged for 7 years. Fact: Derogatory credit items, like late mortgage payments, foreclosures and short sales, appear on your credit report for 7 years, but your credit score can be rehabilitated enough to buy a home or obtain other credit in less time, depending on your circumstances. Your post-short sale or foreclosure waiting period depends on a number of things, including what type of loan you’ll be seeking to buy your next home with, how much cash you’ll have to put down and whether there were any extenuating circumstances involved in losing your home in the first place; some loans allow for an immediate purchase, others require a waiting period of 2, 4 5 or even 7 years after the loss of a home. Of course, your FICO score is also a key criteria in a post-home loss “buy,” but interestingly enough, the length of time it takes to get your FICO score back up depends on how high it was beforehand. Earlier this year, the New York Times reported that it would take a consumer with a 680 FICO score three years after a foreclosure to bring their score back to that level, while it might take someone with a 780 FICO score (near-perfect) seven years for full score recovery. However, the number of missed payments you had before your home was lost to foreclosure or short sale might weigh on how gravely injured your FICO score is in the process. At the going rate at which banks are foreclosing on homes – clocking roughly 2 years of missed payments before a home is repossessed – your FICO score could take an even greater hit than if you were able to divest of it via a short sale in 1 year’s time. REALTORS or For Sale By Owner? The proof is in the purchase. The founder of a do-it-yourself real estate sales business, ForSaleByOwner.com, recently sold his luxury Manhattan condominium-with the help of a professional broker according to the Wall Street Journal. Unable to sell his carefully staged two-bedroom home after six months of practicing what he preached, Cory Sambrotto turned to a professional Realtor (who understood the nuances of the local market) and found a buyer. The apartment-which the Realtor determined had been priced too low and wasn't drawing the right clientele-sold for $150,000 more than Sambrotto was asking! Some people believe that they will save money by selling their home themselves. "Mr. FSBO" may have assumed classified ads and the Internet would sufficiently promote his property; but by hiring a professional, he more than made up for what he paid in commission. Total Mortgage Services, a national mortgage lender, is offering rural home buyers 100 percent financing or closing cost assistance. Closing costs can come from any source, including gifts. No monthly mortgage insurance premiums. Borrowers can obtain a loan to purchase a new or existing home that is located in a designated rural area. “The USDA home loan program is one of the most compelling mortgage products in today’s challenging mortgage marketplace and offers real solutions for rural borrowers, especially those in need of 100 percent financing or with lower credit scores," John Walsh, president of Total Mortgage, said in a statement. To read more about eligibility requirements, visit the U.S. Department of Agriculture Rural Development Web site.